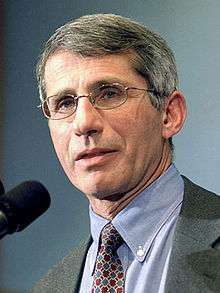 Anthony Stephen "Tony" Fauci (pronunciation: /ˈfaʊtʃi/) (born December 24, 1940) is an American immunologist who has made substantial contributions to HIV/AIDS research and other immunodeficiencies, both as a scientist and as the head of the National Institute of Allergy and Infectious Diseases (NIAID). Anthony Stephen Fauci was born on December 24, 1940, in Brooklyn, New York, to Stephen A. Fauci and Eugenia A. Fauci, who owned a pharmacy in which his father worked as the a pharmacist, his mother and sister worked the register, and Fauci delivered prescriptions. He is of Italian descent and grew up Catholic. He graduated from Regis High School in New York City and went on to attend the College of the Holy Cross and received his M.D. from Cornell University Medical College in 1966. He then completed an internship and residency at The New York Hospital-Cornell Medical Center. Fauci has made a number of basic scientific observations that contribute to the current understanding of the regulation of the human immune response, and is recognized for delineating the mechanisms whereby immunosuppressive agents adapt to the human immune response. He has developed therapies for formerly fatal diseases such as polyarteritis nodosa, granulomatosis with polyangiitis, and lymphomatoid granulomatosis. In a 1985 Stanford University Arthritis Center Survey of the American Rheumatism Association membership ranked the work of Fauci on the treatment of polyarteritis nodosa and granulomatosis with polyangiitis as one of the most important advances in patient management in rheumatology over the previous 20 years. 1 2 3 Gallin, John I. (1 October 2007). "Introduction of Anthony S. Fauci, MD". Journal of Clinical Investigation. 117 (10): 3131–3135. PMC 1994641 . PMID 17909634. ↑ "Fauci89: Transcription of oral history interview" (PDF). NIH. March 7, 1989. Archived from the original (PDF) on April 9, 2016. 1 2 "Biography Anthony S. Fauci, M.D. NIAID Director". NIAID. Archived from the original on October 30, 2007. ↑ Altman, Lawrence K. (16 September 2007). "4 Winners of Lasker Medical Prize". The New York Times. ↑ "All Laureates — English". Jung Foundation for Science and Research. Retrieved 4 November 2016. ↑ Officials eyeing additional screening for Ebola in US, vow to protect citizens from disease - Associated Press - 6 October 2014. Retrieved 16 October 2014. 1 2 3 Roberts, Dan - News World news Ebola CDC director warns Ebola like 'forest fire' as Congress readies for hearing - Ebola crisis live updates - The Guardian. Retrieved 16 October 2014.